In the NBA, it was the Minnesota Timberwolves visiting the Los Angeles Clippers. Many people expected the Clippers to start their second-half run of the season, but this was the game that showed the T-Wolves may actually be dangerous. In this game, Ricky Rubio and Kevin Love combined for a total of 12 points on the night, so we thought they would need to get help elsewhere. And then Timberwolves supporting cast sprung to life, namely their rookie, and #2 overall pick, Derrick Williams from the University of Arizona. He had a career-high 27-point night as the T-Wolves routed the Clippers. If these guys can gel over the second half of the season, they’re going to be dangerous in the playoffs. Minnesota 109, LA Clippers 97. And, in the NFL, next year’s season will start on an odd day — Wednesday September 5th. Traditionally, the league starts their season with a Thursday night kick-off, which has featured the Super Bowl winner hosting a game in year’s past. But this year, they can’t have it on Thursday because that will be the Democratic National Convention. The Giants will host a game Wednesday, although an opponent has not been set. Most likely you will see a high-profile team like the Packers, Cowboys, or Eagles. Finally, in golf, Tiger Woods may have revealed what he would like his 2nd career to be if he wasn’t the best golfer in the world. 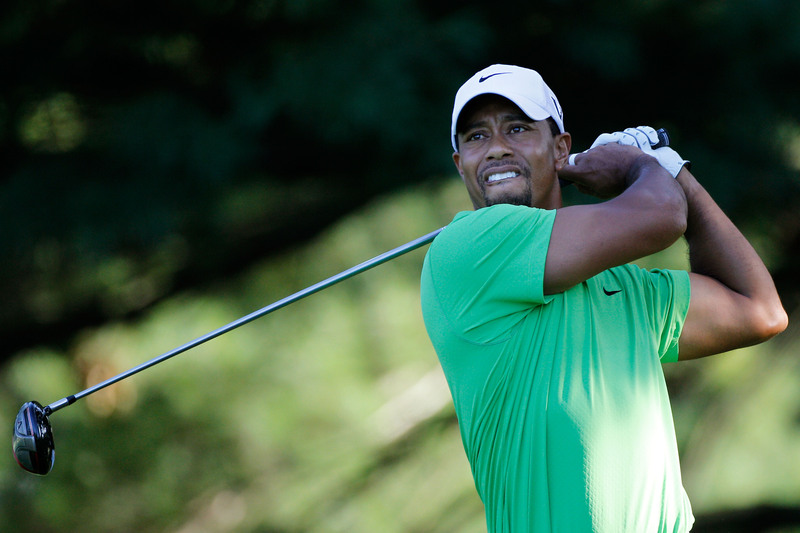 Apparently, Woods is impressed and in awe of the Navy Seals and said he wants to be a seal. Tiger is apparently obsessed with the military (most likely because his father was in it). It was reported that Woods even did some parachute jumps with the SEALS, and has a bit of a boyhood fantasy of partaking in the type of dangerous missions you typically see in the movies. It was the first ever prime time NASCAR event: The Daytona 500 (televised at night because of poor weather the day prior). This was a weird night, as the race was delayed even further. And then, after 159 laps, we had one heck of an explosion when Juan Pablo Montoya’s car collided with a JET DRYER, which was used to dry the track. Except, these Jet Drying trucks actually have 200 gallons of jet fuel. And that… is very flammable. So when a car is sent hurling into the truck, it’s going to cause a huge explosion. As of now, nobody was reported seriously hurt. 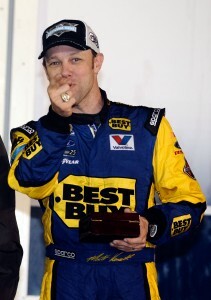 The big winner after two and half days was Matt Kenseth. In the NBA, while the All-Star festivities are fun, they can also leave team owners and coaches holding their breath, as they wouldn’t want their star players to needlessly get injured in an exhibition game. Unfortunately, that is exactly what happened to Lakers’ star Kobe Bryant. 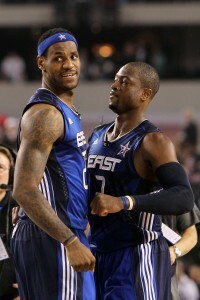 In the all-star game, Dwayne Wade fouled Kobe hard. This bloodied up Kobe’s nose (blood that got on Wade), and Kobe left the game to get checked out. Now it turns out that a CAT scan reveals that Kobe has a broken nose. That’s not exactly the most comfortable thing to play with. 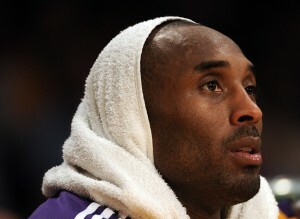 Surely, Kobe will be bandaged up for his next game, because the Lakers, struggling this season, can’t afford to rest him. 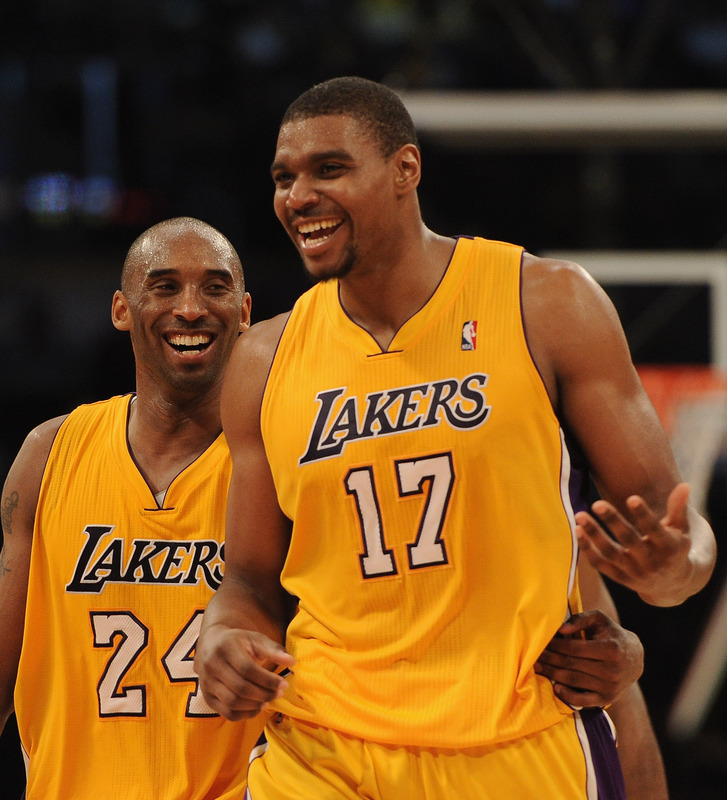 Plus, the Lakers still think they’ve got a shot at getting Dwight Howard or Deron Williams. They have to keep playing hard to try and secure a top playoff spot in the event that one of those guys joins the squad. Finally, in the NBA, there was speculation that the Sacramento Kings, not doing well financially, might move this next season. Top spots included Anaheim or maybe even Seattle. Seattle has been ecstatic about this, as they’re dying to get basketball back. But now, it’s reported, that the Maloofs (owners of the Palms Casino and the Kings) may be signing on the dotted line to get a new arena and keep the Kings in Sacramento. This move has been a HUGE initiative from Sacramento mayor (and former Phoenix Suns star) Kevin Johnson. If they do get a new arena, they would build the arena in downtown Sacramento, which would bolster ticket sales. If Sac-Town does keep the Kings, then it’s possible that the New Orleans Hornets could move to the Seattle area. On Saturday night, we got to see the always anticipated Sprite Slam Dunk Challenge. There has been some criticism of this contest in year’s past for (A) having too many props, and (B) for not having stars like LeBron and Kobe participate. It’s usually the young guns of the NBA showing what they can do, except… nobody’s really heard of them. Last year, Blake Griffin jumped over a car to win the dunk contest — could someone top him this year? This year’s participants: Chase Budinger from Houston, Jeremy Evans from Utah, Paul George from Indiana, and Derrick Williams from Minnesota. The Knicks’ Iman Shuppert was supposed to participate with Jeremy Lin throwing him the ball (with a prop of Lin sleeping on a coach and lobbing it up) but Shuppert was injured and couldn’t be involved. As for the actual contenders, they didn’t do anything THAT special — a lot of rehashed stuff. 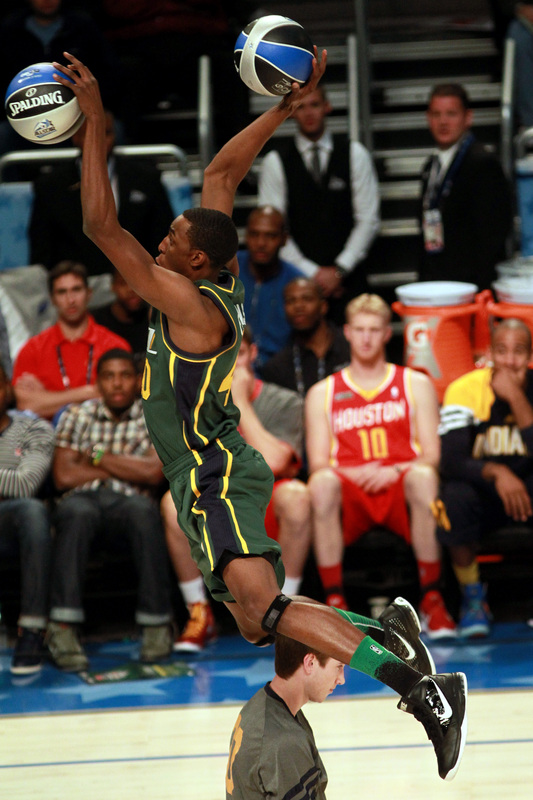 The dunk of the night was Jeremy Evans taking a lob of not one but 2 BASKETBALLS from seated teammate Gordon Heyward. Evans legitimately jumped over him, and dunked both balls. Truly amazing. And with that dunk, the replacement slot (Evans) won the dunk contest. Then, on Sunday, it was time for the actual all-star game. It was LeBron/Dwight Howard/Dwayne Wade and the East vs. a starting 5 that featured 4 all-stars that all play in Los Angeles (Kobe, Bynum, Griffin, Paul — with Durant rounding out that line-up). Remember, this game features absolutely NO defense until, perhaps, the last 3 minutes of the game. The East soared out to a huge lead, getting a number of monster jams from LeBron. But, in the second half, the West would come striking back between some incredible play from Kobe Bryant (now the all-time leading total points champ in NBA All-Star history), and some beautiful tandem play from Clippers teammates Chris Paul and Blake Griffin. It all came down to the final play, and with 2 seconds left, LeBron tried to throw a cross court pass that was picked off by Blake Griffin. He was fouled with 1.1 seconds left. The East, down 3, would get one more chance. 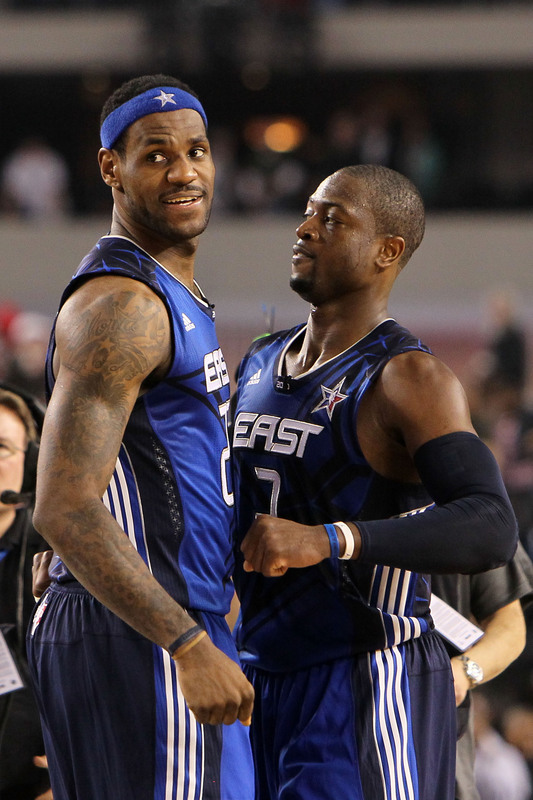 Dwayne Wade got the 3-point shot off, but it wouldn’t go, and the West All-Stars won the game. LeBron and Durant led both teams, each with 36 points. West 152, East 149. Finally, in some other NBA news, it looks like another person is apologizing for an accidentally offensive move surrounding Jeremy Lin’s “Lin”Sanity. This time… it was Ben & Jerry’s ice cream. In Massachusetts, Ben & Jerry’s began selling a flavor called “Taste The Lin-Sanity”. That sounds harmless enough, and the move was only meant to honor the Harvard graduate’s accomplishments. Ben & Jerry’s probably shouldn’t have added one simple detail though: they put pieces of fortune cookies inside the ice cream. And that definitely could be construed as offensive to a number of people. Basically, in all issues surrounding Jeremy Lin’s stardom, you’re safe unless you include any Asian stereotypes. In the NBA, a much anticipated game between the New York Knicks and the Miami Heat. This was the Knicks’ shot against the Heat before the All-Star break; their chance to show their new-look attitude to the Heat. 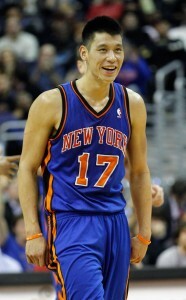 Unfortunately for the Knicks, Lin couldn’t work his magic against the most red-hot team in the NBA. The Heat’s scouting report definitely said something to the effect of ‘Take Lin out of the game’, and that’s exactly what they did. Lin only had 2 points in the first half. They were stealing the ball from him and turning it into transition dunks. The Heat are simply on fire right now. Elsewhere, in the NFL, it’s slowly becoming official that the St. Louis Rams will trade away the #2 pick. 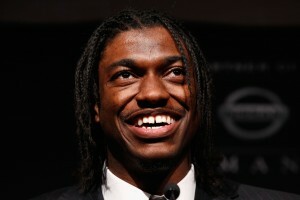 Almost everyone thinks that Heisman Trophy Winner Robert Griffin III from Baylor will be the #2 pick in the draft. The Rams don’t need a quarterback, as they took Sam Bradford 2 years ago with the #1 pick. They will likely get a lot for the second pick, and use those picks to fill other key positions they need. Alternatively, the Rams could keep the pick and draft the stellar Justin Blackmon from Oklahoma State to give Bradford an all-pro beast wide receiver. They could use that as well, but will most likely swap picks with someone. Look for the Redskins or Dolphins to possibly make a move here. Finally, in baseball, last season’s National League MVP Ryan Braun tested positive for performance-enhancing drugs a few months ago. That put his award in jeopardy, but more importantly, it put his reputation as one of baseball’s emerging superstars in jeopardy. All through this, however, Braun has attested that he is innocent. 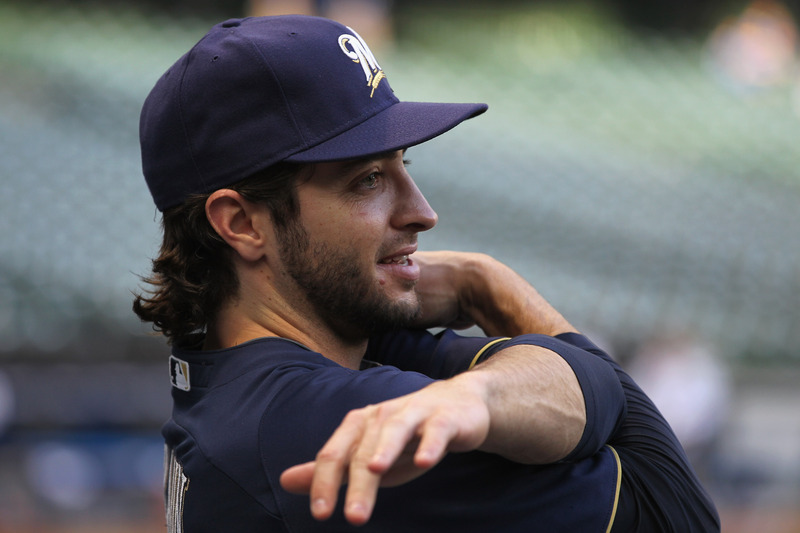 Yesterday, a court overturned Ryan Braun’s 50-game suspension. This is a landmark decision, as no player has ever avoided a suspension when testing positive for drugs. Braun said this is the first step in restoring his image as a clean player just hoping to give his best to the sport of baseball. In the NBA, it was Jeremy Lin and the Knicks back in action against a slipping Atlanta Hawks team. The Hawks are now without Joe Johnson, who will be replaced at the all-star game by the Celtics Rajon Rondo. 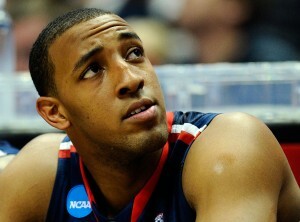 Thing is, the Hawks really need Johnson to win, as he’s responsible for about 20 points per game. Without him, where do those points come from? Jeremy Lin, with teammates Carmelo Anthony and Amare Stoudemire didn’t flinch at the Hawks, and routed them at Madison Square Garden. Lin had 17 points and 9 assists, as the Knicks are starting to really come together as a unit. If these guys continue to have fun and gel, they could be a tour de force in the second half of the season. NY Knicks 99, Atlanta 82. Next up for the Knicks, a true test, as they head to Miami to take on LeBron, Wade, and the Heat. This is a pivotal game going into the all-star break for the Knicks. If they can get past the Heat… IN Miami, that means that they can potentially match up well against them and could pose a threat to Miami’s championship run in the post-season. Jeremy Lin said he wouldn’t change his game against LeBron. LeBron is one of the great defenders, and will be matching up against Lin at different points in the game, but Lin said he just needs to be aggressive and not change anything on his end. This one is a much watch Thursday night! The Los Angeles Angels have launched a HUGE billboard campaign around their new $100 Million Dollar investment Albert Pujols. They put up 20 billboards around Los Angeles with a picture of Albert Pujols and a tagline “El Hombre”. 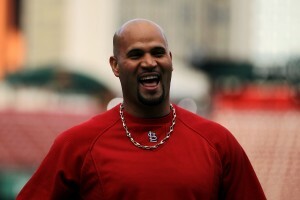 But Pujols came out publicly and said he doesn’t want to be called “El Hombre” (The Man). Why? Because back in St. Louis, Pujols had a relationship with 90-year old Stan “The Man” Musial. “The Man” was singular to Musial in St. Louis — so much so that Pujols asked the Cardinals fans NOT to call him “El Hombre”. He has clearly extended that displeasure to Los Angeles, so they will most likely oblige. In the NBA, after a big win over the Blazers, the Lakers called a “Player’s Only” Meeting. That’s rare in the NBA for just the players to talk amongst themselves. What was it about? Most likely it’s in response to Kobe’s public feud with general manager Mitch Kupchak. This is in regards to Kupchak stirring up the team by not being clear about the future of Pau Gasol with the Lakes. Kobe said, “Trade him or don’t”. Kupchak responded saying he can’t discuss things publicly, he’s working on something, and he can’t say anything more as not to upset things. There’s a very good chance that Kobe needed to talk to the Lakers about staying focused even though things could change dramatically very soon. Elsewhere in the NBA, after Monday Night’s game at Madison Square Garden between the New York Knicks and the New Jersey Nets, Jeremy Lin had some words in the hallway with Kris Humphries (the former Mr. Kim Kardashian). Fans at MSG typically boo Humphries because they were annoyed by Humpries public marriage and romance with Kardashian that they believe was inauthentic and done for money. Knicks fans don’t like that. But, in the hallway after the game, Lin actually had some nice words for Humphries, saying, ” Hey, I don’t know why they boo you, but I think it’s crap, and you’re playing really well”. Kris Humphries appreciated this and said that he thought Lin was a nice guy and that it’s great when good things happen to nice people. Jeremy Lin is certainly a man of high character. Finally, in the NFL, it’s been 11 days since former Kansas City Chiefs head coach Todd Haley was tapped as Pittsburgh’s new offensive coordinator. 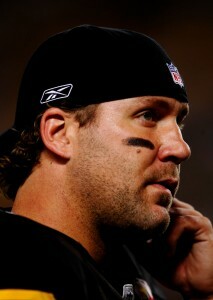 But, Quarterback Ben Roethlisberger said he has yet to hear from Haley. It’s very odd for an offensive coordinator not to talk to his quarterback, especially since Big Ben will be responsible for running ever single play Haley draws up. 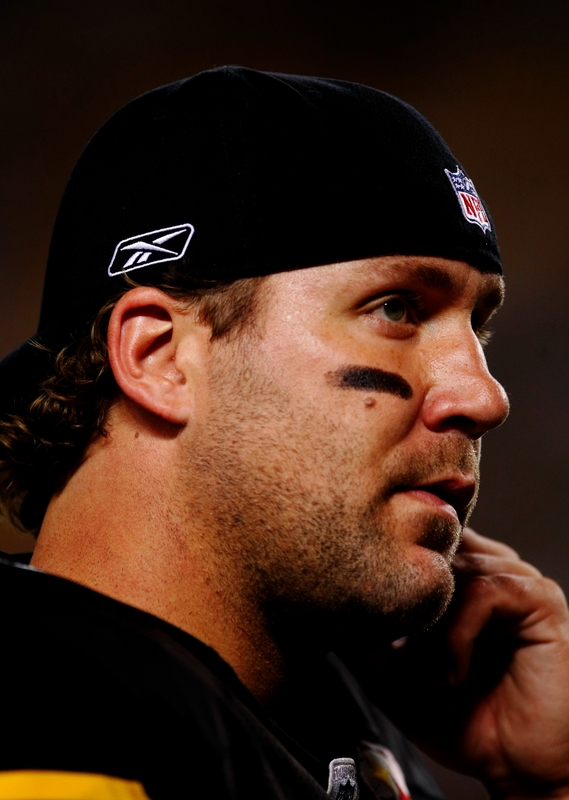 Perhaps Big Ben is thinking that there are some major clientele moves coming that head coach Mike Tomlin doesn’t want Roethlisberger to know about. It’s said that the Steelers might try and move star wide receiver Mike Wallace (too expensive) for some draft picks. Perhaps they don’t want Big Ben’s opinion on that. In any event, this is a pretty strange circumstance, and it would be understandable to believe there may be something fishy brewing in Pittsburgh. In the NBA, the “Lin”sanity of Jeremy Lin continued this weekend. On Friday, Lin took his 7-game winning streak with the Knicks into New Orleans to face the Hornets. But, Lin wasn’t sharp in that outing, turning the ball over more than 10 times. He tried to rally with a solid performance toward the end of the game, but it was too late and the Hornets snapped their streak. 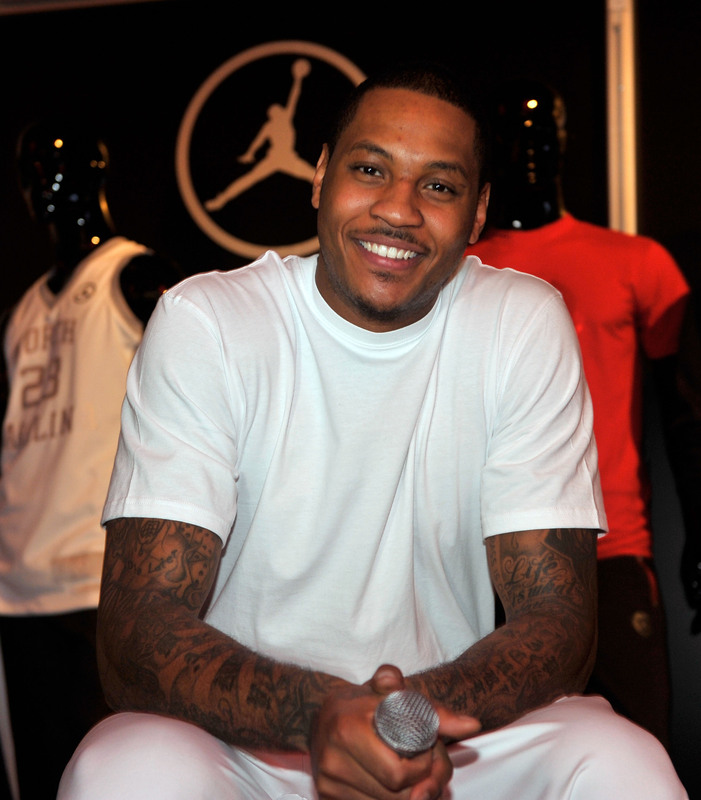 So, the Knicks were looking to rebound on Sunday when they took on the defending champion Dallas Mavericks. The Mavs started out strong, but thanks to a strong performance from Lin in the second half, finishing with 28 points and 14 assists, the Knicks rallied back and took down the Mavs. Jeremy Lin is for real. Just a fantastic story in the NBA right now. New Orleans 89, NY Knicks 85. NY Knicks 104, Dallas 97. Elsewhere in the NBA, the Chicago Bulls have sorely missed the presence of their superstar Derrick Rose. On Saturday, the Bulls lost to a inferior New Jersey Nets team by 12. So, they were thrilled that they finally got Rose back to play in a special President’s Day against Atlanta. The Bulls got out to a hot start, outscoring the Hawks 35-17 in the first quarter. But just when they thought the Hawks were dead, Atlanta came soaring back, oddly behind some clutch shots from former superstar Tracy McGrady. 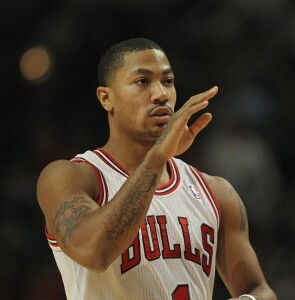 But, in the end, Derrick Rose put on the finishing touches with some sweet fade away shots to give the Bulls the lead. 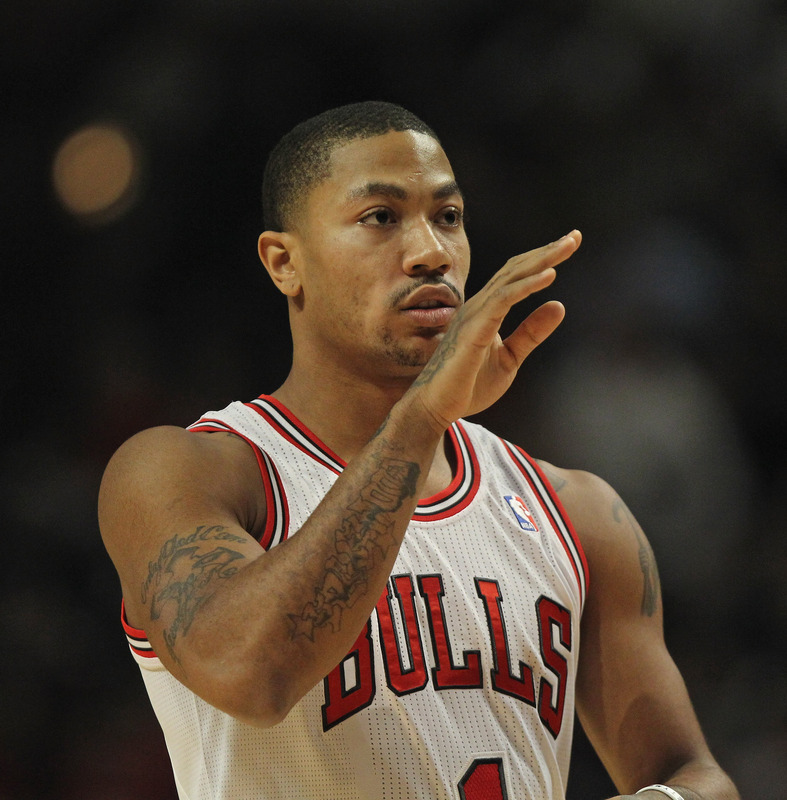 Rose finished with 23 points in his triumphant return. Chicago 90, Atlanta 79. Finally, in the NBA, while the Clippers are doing great in Los Angeles, the Lakers appear to be in disarray. This is primarily because of the locker room issues with Pau Gasol. There have been rumors surrounding his name since before the season began. Will he be traded? Are the Lakers bringing in Dwight Howard? Is Pau staying. 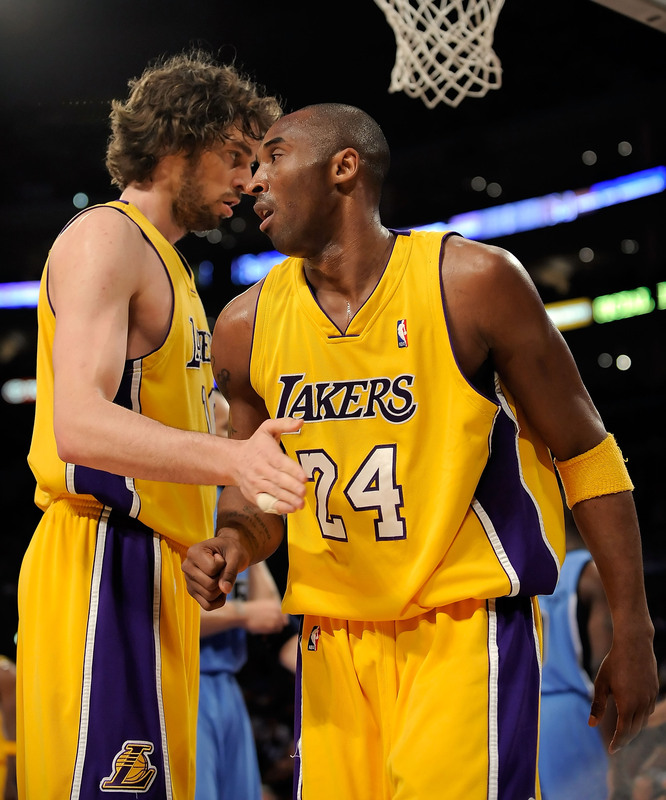 Finally, Kobe Bryant addressed team management saying, “Either trade Pau Gasol or don’t”. Kobe was saying that basketball is an emotional game, and that players need to have their head fully in the game at all times. Kobe knows that this issue has been bothering Gasol, and scolded team management to stop rumoring to the media. Either do it or don’t. Kobe said he would like Pau to stay in town, but if they’re gonna get rid of him… just do it. Either way, the Lakers need to make some kind of move if they want to be competitive in the playoffs. In the NBA, former superstar Allen Iverson just isn’t ready to call it quits on his NBA career. He was a one of the best players in the league while on the Philadelphia 76ers, and continued playing fantastic when he went to the Denver Nuggets. But, his career hit the downslide when he went to Detroit. 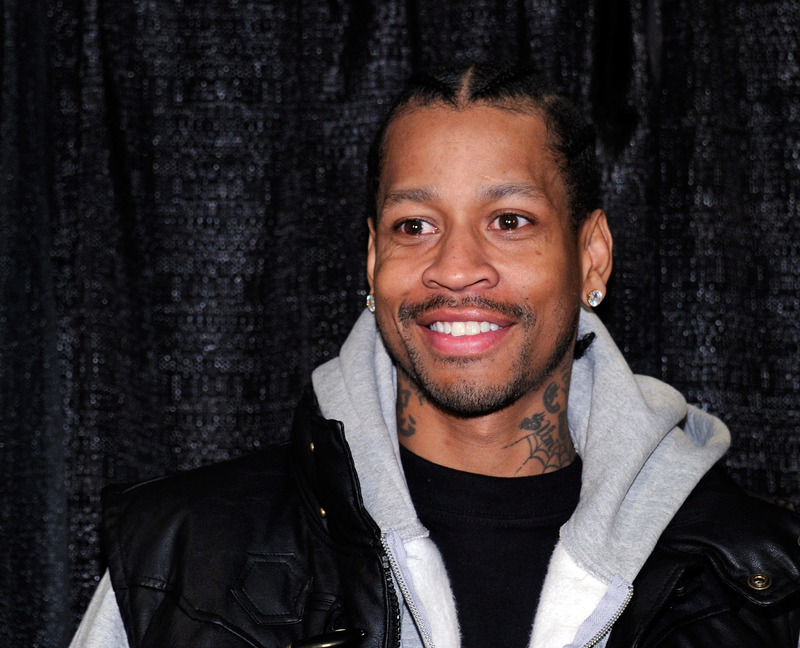 Last year, Iverson went to play overseas in Turkey, but didn’t do much there. Now, wanting one last shot in the NBA (and needing money), Allen Iverson said he is prepared to play in the Minor Leagues. That could be in the Caribbean, South American, or even the D-League. Now it looks like the Los Angeles Lakers minor league team is looking to give him a shot. But Iverson said he ONLY is willing to play in the D-League if it will legitimately lead him back to the NBA. There’s no guarantee there, but it’s interesting to see a guy who is regarded as one of the greatest 50 players to ever play not wanting to call it quits. This guy wants to play bad! Elsewhere in the NBA, amid all the hoopla that the Knicks emerging star (Jeremy Lin) won’t be able to gel with superstar Carmelo Anthony, an interesting quote comes out. The Knicks are riding an 8-game winning streak with Lin, and some are reticent to break up the magic putting Anthony back into the line-up. But yesterday, Lin came out publicly and said that he actually got his chance BECAUSE of Carmelo Anthony. Apparently, when the Knicks were dealing with some serious injury problems, it was Carmelo’s idea for Lin, the young prospect playing well in practice, to start. The coaches agreed, and the last 8 games are history. So it’s hard to believe that, given this chemistry, they would have any setbacks once Anthony returns to the line-up. Finally, some sad news from the baseball world. After a long battle with brain cancer, former New York Mets all-star catcher Gary Carter has died. Carter was a household name in the 1980s in New York. A good-looking guy who also had a great reputation as a very nice man. Carter was inducted into the baseball Hall of Fame in 2003, and it was something he was extremely proud of. Fellow Hall of Famer Mike Schmidt said of Gary Carter’s induction, “No player ever appreciated that call to the extent he did. The joy it brought him, his family, and friends, especially me, was so real and pleasantly genuine, I ate it up and still do”. The sport will forever miss Carter. In the NBA, Jeremy “Lin”sanity continues. The Knicks are on a 4-game winning streak since Jeremy Lin joined the starting line-up. They finally took that show on the road to Toronto against a pesky Raptors team. Jose Calderon has been playing great for the Raptors, and his 25 points gave them a healthy second half lead. 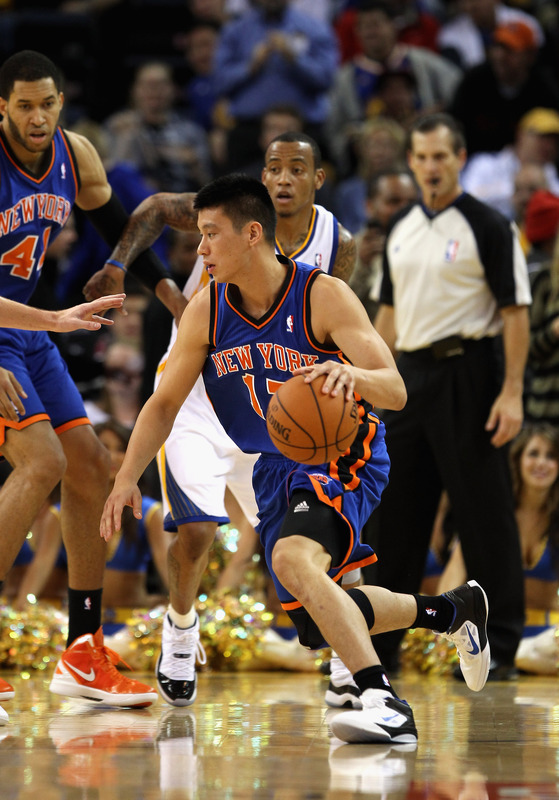 But, in the end, it all came down to Jeremy Lin… again. Lin had 27 points on the night, with none more important than his shot with less than a second left. He nailed a 3-pointer to break the tie and give the Knicks the lead they needed to ice the victory. That puts them on a 5-game win streak, with Carmelo Anthony and Amare Stoudemire about to rejoin the starting line-up. This could get really interesting, really quickly. NY Knicks 90, Toronto 87. Elsewhere, in the NFL, the Peyton Manning drama continues. Indianapolis Colts owner Jim Irsay said that, ideally, he’d like to leave Peyton Manning’s career in Peyton Manning’s hands. 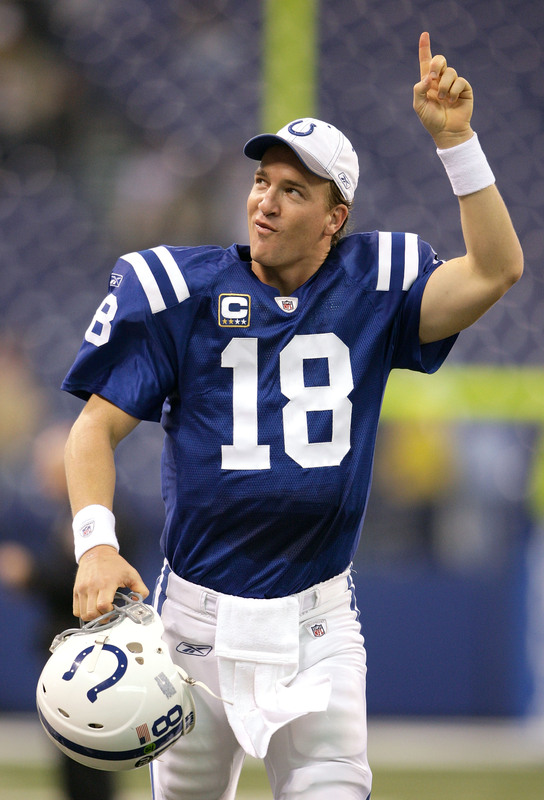 He said the door is open if Peyton wants to stay, that the Colts owe that much to Manning. The Colts have to decide by March 8th if they will pay Manning a $28 million bonus to stay on the Colts the next 4 years or decline, at which point Manning becomes an unrestricted free agent. In other words, they’d be letting him walk. Most likely, Manning is on his way out, especially since Stanford’s Andrew Luck is likely on his way in. But the Colts owner doesn’t want to be RESPONSIBLE for getting rid of Manning. He would be lambasted. There was speculation that Manny Ramirez would have a new home next year: The Baltimore Orioles. The Orioles have a bunch of up-and-coming talent, but could use a slugger like Ramirez to occasionally clear the bases. But now, the Orioles are publicly saying that they are no longer interested in bringing Manny to town. 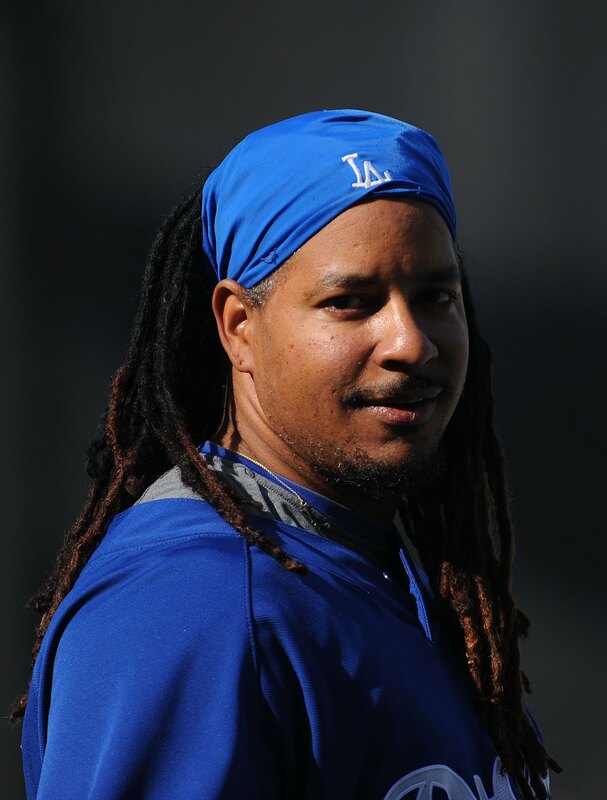 They’re saying that they don’t think the 39-year old former all-star fits the culture of the clubhouse right now. Plus, the Orioles have 4 players on their roster who hit more than 20 home runs last year, and that’s a rarity in the league. In other words, they don’t really need Manny’s primary skill: Blasting the ‘every-now-and-then’ home run. Either way, look for the Orioles to be a team on the rise next season. In the NFL, we may be getting a treat next season. After a downward spiral, Randy Moss, essentially, had to retire. He had an amazing late career in New England, until he had some serious issues and became a nuisance to the Patriots organization. After that, the Pats shipped him off to Minnesota, where he did absolutely nothing. So… he retired. He waited for the phone to ring in the 2011 season, but nobody called for his services. 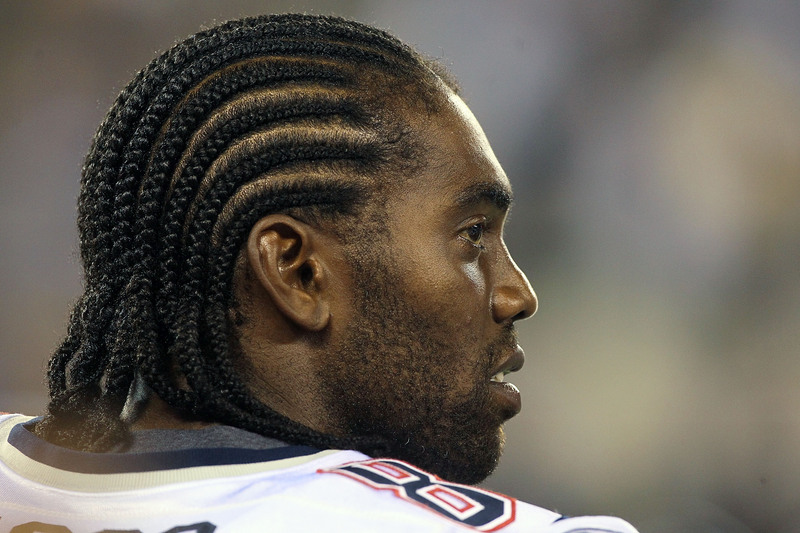 Now, after a year off, Randy Moss says he wants to play football again. Randy Moss is now 35 years old, and that’s pretty old for a such a physically demanding position as wide receiver. Moss said he needed to work some things out in his life, but is ready to play football again. Most likely nobody is going to bite on Moss, as he showed that he was pretty much washed up in 2010 — even on the Titans who brought him in for that extra kick on offense. But, you still have to wish him luck on a comeback. Elsewhere, in college football, in an effort to survive, two small conferences are joining forces. It looks like the Mountain West and Conference USA may unite to form a large conference of young, pesky, up-and-coming programs. The Big East raided both of these conferences towards the end of last season, inviting TCU and Memphis to join (this after several Big East schools are bolting for the ACC). The new conference doesn’t have a name, but would most likely be ready by the 2013-2014 season, and would include UNLV, New Mexico, Wyoming, Colorado State, Air Force, Hawaii (in football only), Southern Miss, Tulsa, Marshall, Rice, UTEP, UAB, Tulane, East Carolina, Nevada and Fresno State. This conference might even have its own championship game, which could have BCS implications. It will be interesting to see if they pull this off. Bottom line is they need to. Finally, in the NBA, everyone knows about “Lin”sanity — how Jeremy Lin has totally turned this New York Knicks team into a winner. The oddest thing about this is he’s done it with all-stars Carmelo Anthony and Amare Stoudemire on the bench. Thus, Knicks fans have been asking questions as to whether Carmelo’s return would rattle the solid chemistry the Knicks are experiencing. After all, Anthony is an alpha-dog and typically wants the ball in his hands. But, just yesterday, Carmelo said that he can co-exist with Lin. ‘Melo said that when he gets back, he still wants the ball in Lin’s hands, with LIN running the show. Carmelo said he would play off THAT. If this is possible, then maybe the Knicks actually do some serious damage in the playoffs.